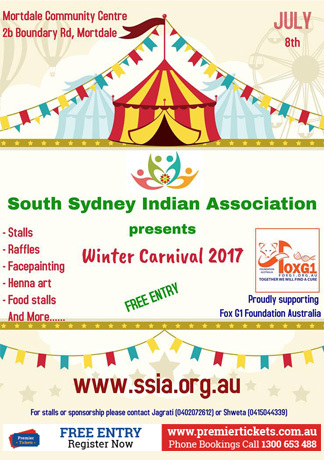 South Sydney Indian Association cordially invites you and your friends to attend the Winter Carnival 2017 to support the cause. FREE invitation to everyone. Encouraging local businesses to come forward and display their products, talent to our community. Get together and have a good time all for a cause. Raise funds to support International FoxG1 Foundation Australia. The goal of the International FoxG1 Foundation is to provide hope and support for individuals with FoxG1 and their families. We aim to achieve this by seeking to raise awareness of FoxG1 and to progress research to find a cure for FoxG1 Syndrome. We also seek to assist families with updates on latest research and advances to ease the symptoms and alleviate care to make the lives of affected individuals as comfortable as meaningful as possible. Premier Tickets Australia is proud to be the online ticketing partner for WINTER CARNIVAL 2017 at Mortdale Community Centre 2b Boundary Road, Mortdale NSW 2223.